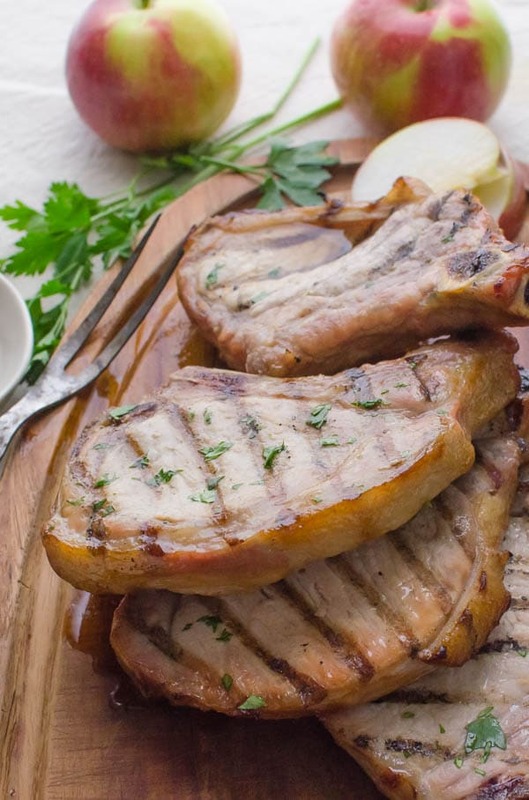 Pork chops can be moist, juicy and flavorful or NOT. They can be tender, juicy and succulent or dry, chewy and wholly unappetizing. If you’ve ever had the latter, then you’ll definitely appreciate the former. 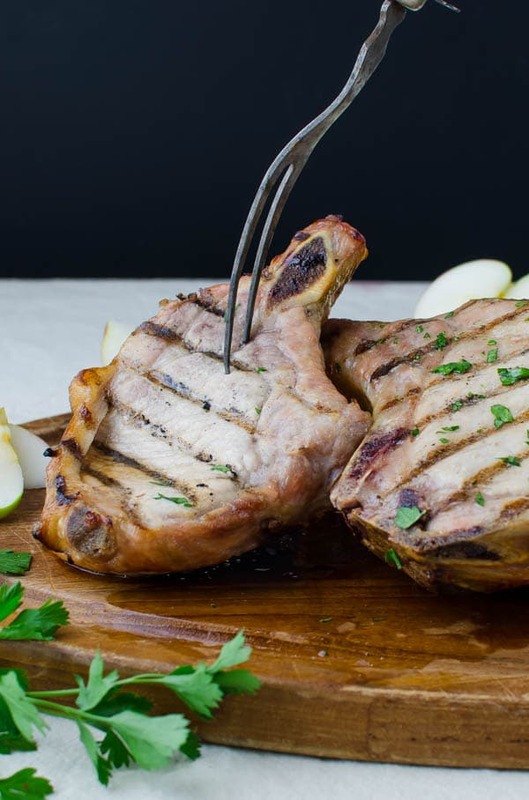 And these Brined Grilled Pork Chops will be at the top of your favorite, easy pork chop recipes list! When I was a kid, there was all kinds of hubbub about eating undercooked pork. As in, don’t do it. You may remember trichinosis, a parasitic worm, which sent every homemaker scurrying back to the stove to cook the hell out of their family’s pork chop dinner. Nowadays, we don’t hear much about this affliction. The number of cases has decreased because of legislation prohibiting the feeding of raw meat garbage to hogs, increased commercial and home freezing of pork, and the public awareness of the danger of eating raw or undercooked pork products (thank you Wikipedia). Why do I mention this? Because for years, the hysteria surrounding trichinosis left us all with dry, mealy, gristly chops and roasts . No amount of gravy could hide the uninspired, overcooked meat. That’s why Alice from the Brady Bunch (may she rest in peace) served her pork chops with apple sauce, otherwise it was like chewing shoe leather. Which brings me to today’s post. I’m very happy to report that I haven’t had a dry pork chop (or chicken breast) since I discovered brining. It’s hardly a new concept, but for certain cuts of pork and chicken and turkey, it truly makes all the difference. The simplest brines, made of a water and salt solution, permeate the flesh and hydrates the individual cells and also imparts mild flavor. The result is a tender, juicy and flavorful cut. Seriously, if you haven’t brined your chicken or pork before, you must, must, must try it now! 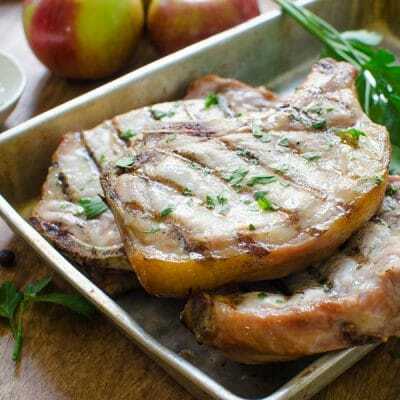 Grill guru, author, television host and professor of BBQ U, Steve Raichlen, (one of Scott’s barbecue heroes), has a simple brine that he uses for pork chops in his book, How To Grill. We purchased this book in 2006 and it is so worn that the binding has failed and the pages are constantly being shuffled between the front and back cover, much like a deck of cards. I’ve adapted this recipe from the one in his book. Want more grilled pork recipes? Try this Tandoori Pork Tenderloin or this Tequila Marinated Grilled Pork. If you've ever had a pork chop that's as tough as shoe leather -- you know it's not pleasant! 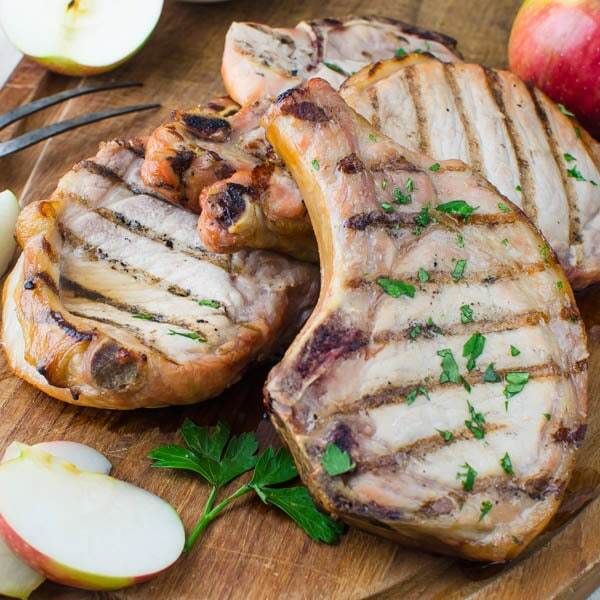 Brined Grilled Pork Chops are juicy and tender EVERY TIME! 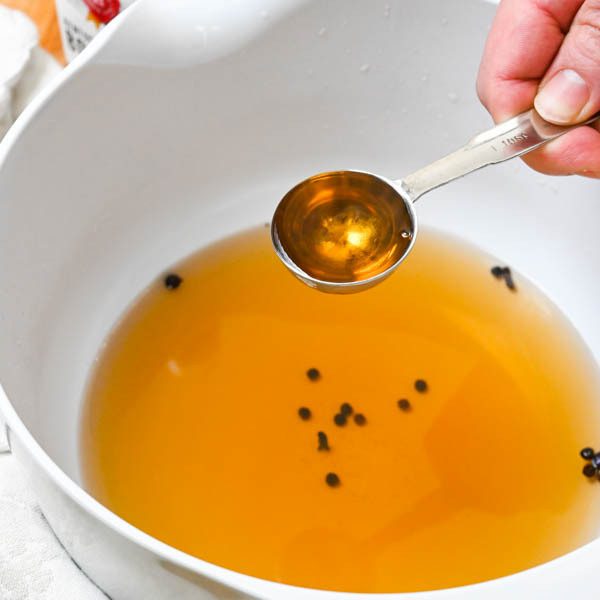 In a large bowl combine salt, sugar, peppercorns, allspice and cloves. Add hot water and stir until sugar and salt are dissolved. Add ice cubes and stir until ice melts and mixture is cold. Add bourbon and onion and 1 cup cool water. Add pork chops, making sure they are covered by the brine solution. 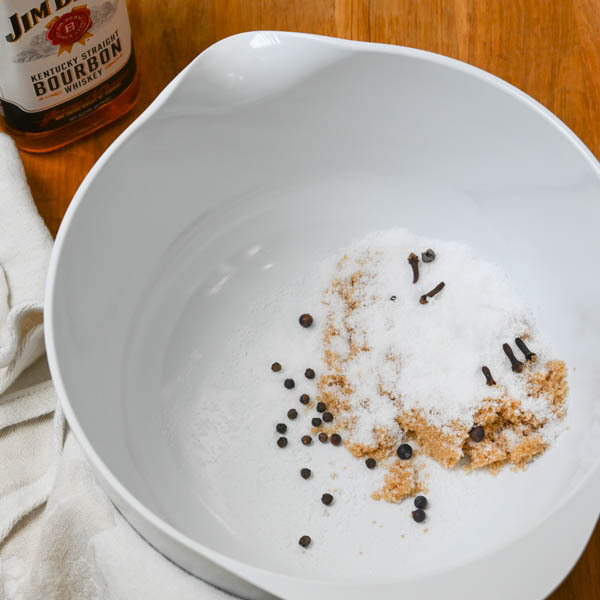 Place bowl in the refrigerator for 3 hours. 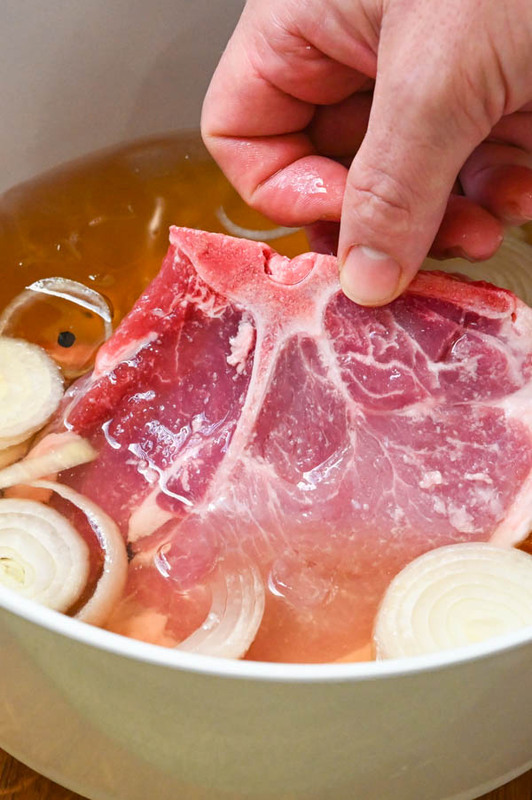 Remove pork chops from brine solution and dry them off completely with paper towels. Heat your grill to a medium high heat about 450 degrees. Cook chops on the grill for about 5-7 minutes, depending on thickness. Turn chops over and cook for an additional 5-7 minutes or until juices on top of pork run clear. Transfer chops to a cutting board. Tent chops with aluminum foil and let rest for an additional 5 minutes so that the juices redistribute back into the meat. Serve. *Personally, I always prefer bone-in meat over boneless - it's more flavorful. If you have thicker pork chops, i.e. 2" thick -- brine for 4 hours before grilling. 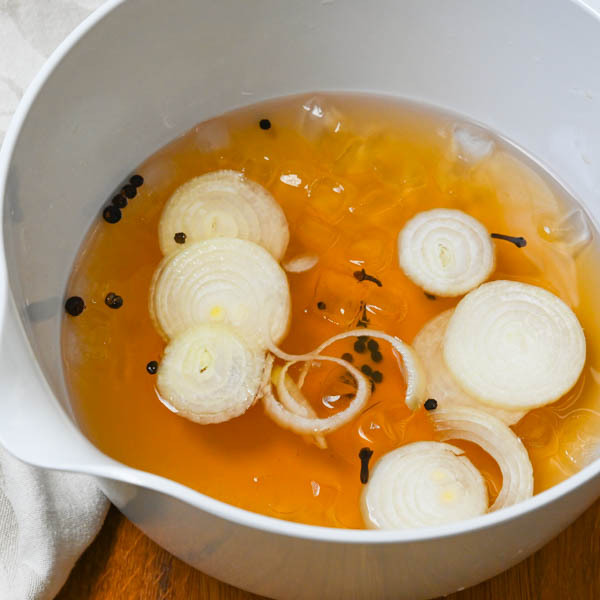 Use the same brine for chicken breasts, but lessen the brine time to two hours, for optimum results. I think we’ve all had that applesauce experience! These are on the menu here at least 2-3 times/month! Wow, your Dad was a scientist? How cool is that? I’d put him in charge of the Thanksgiving turkey too! I usually use a brown and braise method for moist chops (as my mom taught me! LOL) I do sometimes like to grill them, though, and I never have managed to get a grilled chop really juicy. Never tried brining, and clearly I need to! It makes all the difference if you like a juicy, tender chop! Looks great Lisa, what a wonderful, informative post. 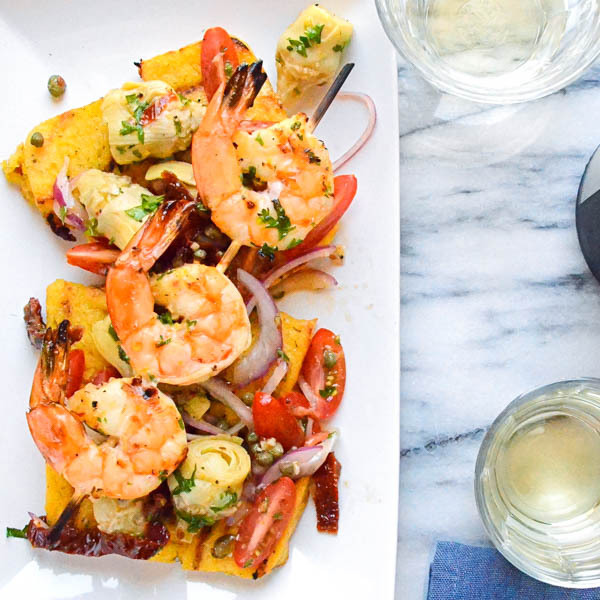 I will be trying this soon (we are not experts at the grill and I love the idea of grilling).